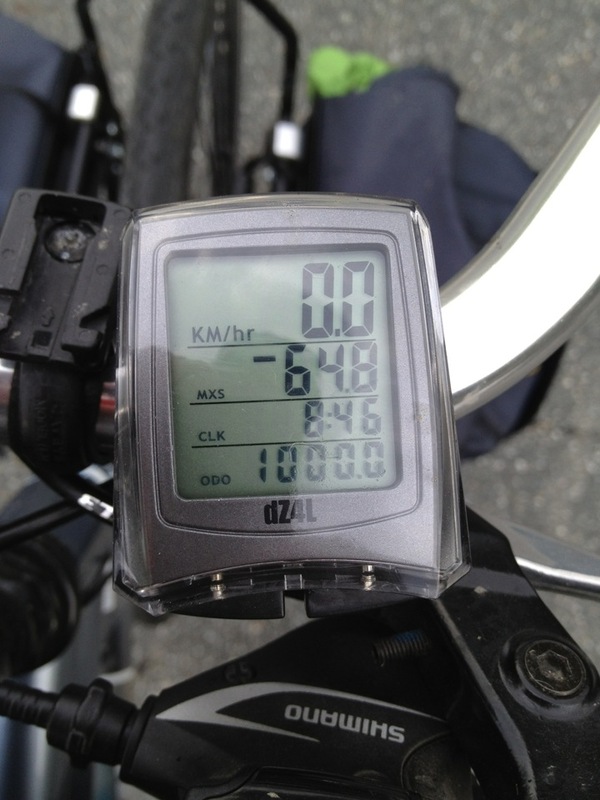 500 Kindnesses Ride Day #13 – Route Change! On our rest day, we had a chance to catch up on a few things. Daegan, being a teenager, caught up on sleep, sleeping through the better part of the morning. And as my friend and her mom had some things to do out of town, I caught up on the trip, checking in with couchsurfing hosts to revise arrival dates, and in the bigger picture it was time to see where we were relative to our planned timeline. What I found was a little disappointing. the extra days we took in Montreal, Burlington, and Montpelier had caught up with us. 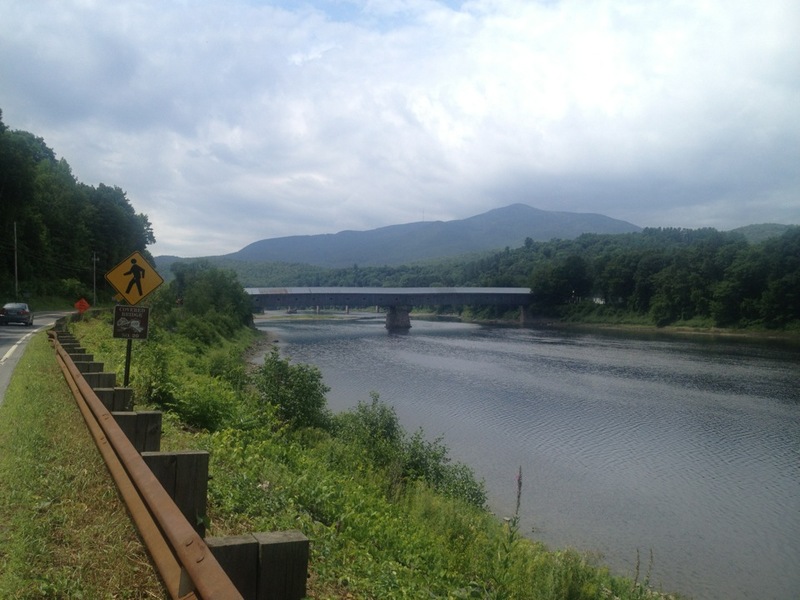 We could still do the rest of our planned route across New Hampshire and Maine and down through Boston but sadly if we did that and took only our planned rest stops we would arrive in NYC and have to leave the next morning. So much for relaxing and enjoying the big city. And that assumed we had no mechanical problems, no really bad weather, no lovely beaches we wanted to relax a little longer on, and no days we just wanted to stop early as we had already a couple times on this trip. And so when Daegan woke we talked about turning a bit more directly toward NYC. In the end we both agreed that this plan, which would bring us to New York a bit earlier than expected would be the safer bet and let us not stress out about making kilometres instead of having an enjoyable trip. And so we cancelled our couch requests on the old route, plotted a new one and sent out some last minute requests. Our new plan would take us due south the next day instead of east. We could find no hosts available in the next stop, Springfield, Vermont, and so we made reservations at a Holiday Inn not far from our planned route. That took the better part of the morning which fortunately left the afternoon and evening for us to hang out. We ended up going to a diner for burgers for lunch. The day was stiflingly hot and the diner was not air conditioned, but fortunately there was something there that unfortunately we can’t find easily here in Toronto: unsweetened iced tea. For some reason a tall glass of that made the hot restaurant completely bearable. That afternoon by the time my friend and her mom returned, it was extremely hot out. But the air had a noticeable stillness, and then not long afterward, the winds started to pick up and before long the rain came. First lightly, and then torrential. Yet again, it seemed, that other than our third day out when we were drizzled on for a few minutes, the rain timed itself perfectly with our rest days, helping to make for cooler riding the next day. As the rain stopped, another old high school friend came by with her boyfriend and we had a delicious feast and caught up on our lives. The next morning we had our first breakfast, said our goodbyes to our hosts, and loaded the bike with our first rest stop already determined about 30 kilometres away – the 4 Aces Diner. In addition to being a lovely old fashioned Worcester car diner with excellent breakfast, it also happened to be a bit more special for me. In 1991, after meeting online, my partner, Sage came for a visit. On our first morning together we woke to the ground covered with snow and we walked together from the house I was living in – about 20 min to this diner to have breakfast. Four days after that breakfast, instead of going home as scheduled, Sage decided to stay forever. Daegan trying not to fall in the river. 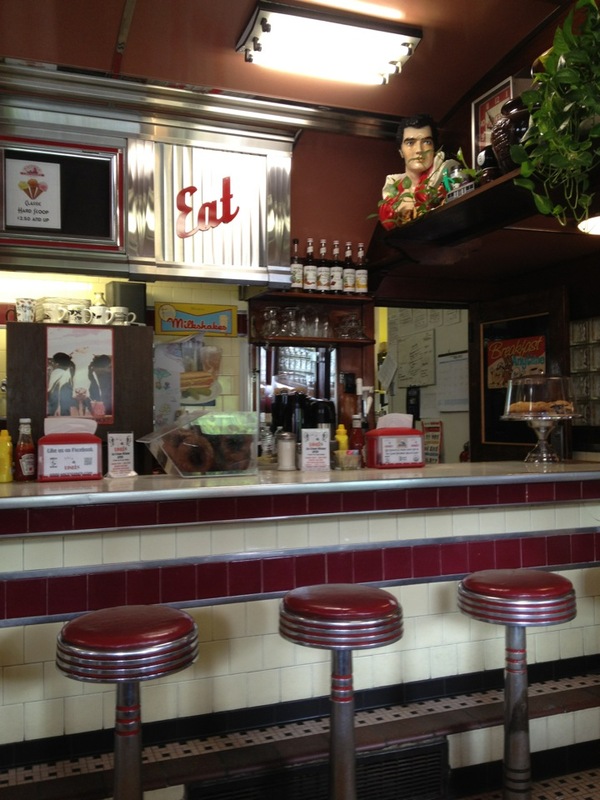 At the Four Aces Diner, Elvis watched over us while we had our breakfast. 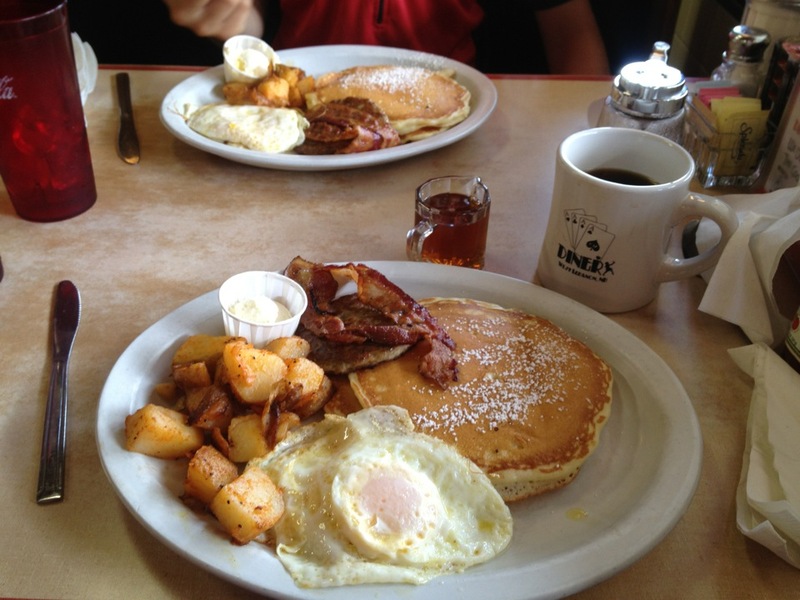 A perfectly delicious “second breakfast” – with real maple syrup, of course. 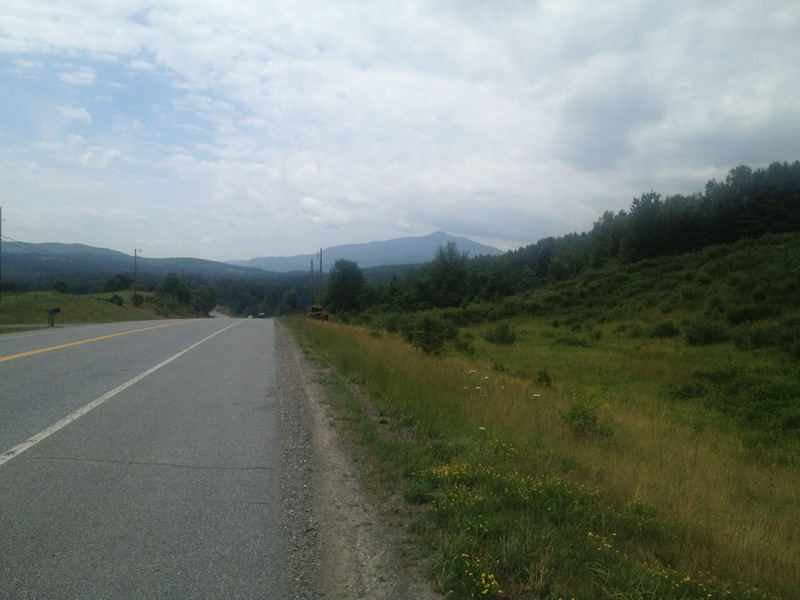 After breakfast We headed south on the New Hampshire side of the border through rolling hills and forest. The views were lovely though at times the shoulders were a little narrow. Still, the views were worth it. Finally we reached Cornish where we were to cross to Windsor. 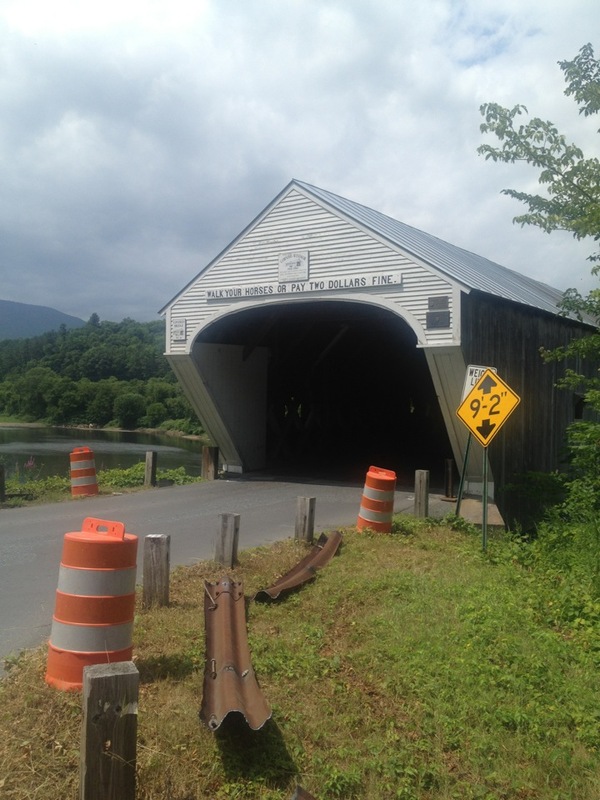 To do this we crossed the longest single-span covered bridge still carrying automobile traffic. The Cornish-Windsor covered bridge. Traffic was light and so we were able to be relatively slow as we crossed. The most memorable part for me was the smell – instead of asphalt or exhaust, the inside of the bridge smelled of wood. Delightful. The sign says “Walk your horses or pay two dollars fine” – we were able to ride our bike without worrying about being fined. We followed US Route 5 down the rest of the way to Springfield where we arrived at our hotel relatively early. In fact, our room wasn’t even ready. The desk clerk had a great suggestion, though. She handed us two towels and an access card and so, after locking the bike up for safekeeping, we headed to the pool where we spent the next couple of hours lounging and relaxing. The only downside of this hotel’s location was that it was not in the village of Springfield itself. All that was around was a gas station and an interstate on-ramp. The village itself was a few kilometres to the west up what appeared to be a pretty steep hill. Fortunately we were able to find a pizza place who would deliver and so I had a sandwich and fries. Daegan ate like a growing 13 year old who had just biked over 1,000 kilometres and consumed an entire pizza and some of my fries as well. That night we relaxed and I continued our search for couchsurfing hosts for the rest of the trip. Looking at the map as I did this I saw how much shorter our trip had become. While it was exciting to think of how close we now were to our goal, it was also a little sad to see that we were much closer to the trip’s end. Oops! Fixed it. Thanks for letting me know. I moved these from a blog that is now offline so *I* see the photos no matter what but nobody else can. If I forget to edit it properly then nobody can see them. Oh that’s really tough lol!! Next Next post: Photo Challenge: Canine Aviation!